San Francisco tenants are experiencing high rents, a subsidized, affordable, and below-market-rate housing shortage, and an eviction epidemic. A month of tenant conventions in neighborhoods across the city brought over 650 tenants together to learn about how speculation is affecting their neighborhoods as well as ways to interrupt the process and fight back. In May and June, the San Francisco Anti-Displacement Coalition (SFADC) hosted 9 conventions throughout the city, from the Richmond to North Beach, Chinatown to the Excelsior. The conventions included “‘Know Your Rights’ workshops, focused on common landlord harassment practices that tenants often experience in isolation, with a goal of empowering tenants to be part of a community that fights back. Additionally, tenants learned how to identify speculation in their neighborhoods, and how to support neighbors to resist evictions and development intended to displace our communities. Since the conventions, tenants are continuing to organize together. In the Mission, over 20 tenants have begun a Speculator Watch Academy to build more skills and confidence as tenant advocates in their neighborhoods, churches, and communities. Contact alicia[at]hrcsf[dot]org to learn more. In the Central City neighborhoods, tenants gathered for an evening of door-to-door outreach in buildings owned by the city’s biggest landlord, who have been harassing and trying to force out long-time rent control tenants. Contact brad[at]hrcsf[dot]org to get involved. On the West Side, a tenant convention for Park Merced, SF State, and Sunset residents be hosted October 19th contact joy[at]hrcsf[dot]org. Reach out to sfantidisplacement[at]gmail[dot]com if you want to kept in the loop about upcoming actions, workshops, academies, and more. Visit our resources page for downloadable Know-Your -Rights guides to share with friends and neighbors, and a Speculator Watch Kit to help you fight evictions and displacement in your community. Chinatown: May 14th, Gordon J Lau Elementary: The Chinatown Tenants Convention featured a documentary that Chinatown CDC produced for the event. “Protecting Chinatown: The Last Line of Defense” depicts SRO tenants organizing against gentrification. Supervisor Aaron Peskin was invited as a keynote speaker and stayed to listen to tenants’ concerns. Tenants discussed strategies on defending SROs in Chinatown, as well as tactics to identify real estate speculative moves in the community. West Side: May 18th, Richmond Rec Center: The Housing Rights Committee hosted a convention to engage tenants in the Richmond, the Sunset, Parkmerced and other areas of the West Side. Tenants spent time getting to know each other, learning how speculation and related policy impacts those living on the west side, and developing strategies to tackle speculation. Tenants voiced a desire to build more affordable housing, to have more navigation centers, to defend small businesses, and to protect their most vulnerable neighbors. Tenants on the West Side are becoming organized! In previous years, tenants on the West Side had to seek resources and communities in other parts of the city. But in response to the need, tenants are coming together and asserting our power. Excelsior: June 3rd, Leadership High: The first-ever Excelsior Tenant Convention opened with inspiring music from musician activist Francisco Herrera. Sponsored by Causa Justa, the San Francisco Tenants Union, the Housing Rights Committee of San Francisco, PODER, and other Mission based community organizations, the convention included a resource fair and workshops on everything from tenant rights and immigrant rights to financial well-being, dealing with stress, the local and regional housing landscape, and building better neighborhoods through organizing. Each session was filled with folks eager to fortify themselves with knowledge. The Excelsior district of San Francisco is now in the cross-hairs of developers and some landlords who see the old-school family friendly district as nothing more than a goldmine for their luxury housing plans and a way to force long-time tenants out to bring in a new type of renter willing to pay exorbitant rents. This has led to an upswing in Owner Move-In and Costa Hawkins evictions. Fortunately, through the strong organizing of local groups, renters are realizing they have the tools to fight back against these claims. Castro/Noe Valley/Duboce: June 3rd, The Women’s Building: The District 8 convention opened with video clip from 1978 where Harvey Milk discussed his proposed a tax to curb speculation and resulting displacement. Speculators may be using new tactics, but the issues themselves are not new! Hosted by the SF Tenants Union, Housing Rights Committee, Harvey Milk LGBT Democratic Club, and the Metropolitan Community Church, the agenda included Know-Your-Rights presentations, as well as how to understand and identify speculation in the neighborhood. As part of an effort to define the problem, participants mapped their homes on a big wall map, and added locations where they knew no-fault evictions had occurred. Afterwards, participants broke into small groups by neighborhood to dig into concrete ways to intervene in speculation and displacement. Many pledged to create an activist network to monitor their buildings and neighborhoods to fight speculation and displacement. Since then, tenant leaders have continued to come out to actions and door-knocking days to fight for tenant rights and supporting their neighbors citywide to stay in their home. Mission: June 7th, Buena Vista School: The Mission convention included know-your-rights workshops on issues ranging from how to get repairs done to dealing with landlord harassment. Additionally, participants looked at the rise of luxury developments in the city and considered strategies for resisting projects that lead to displacement of long-time residents. Many attendees left committed to continuing the fight on their blocks, and two dozen have returned for an ongoing Speculator Watch Academy. 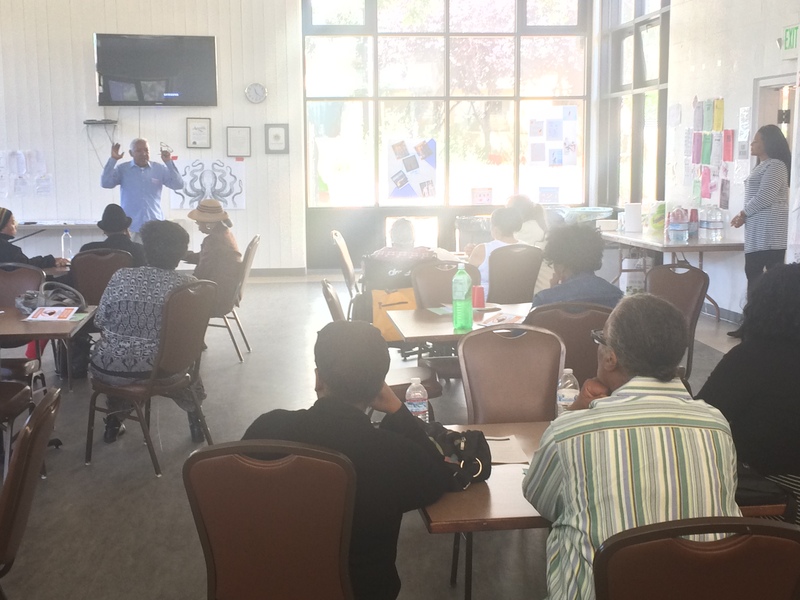 Western Addition: June 10th, Rosa Parks Senior Center: The Western Addition tenant’s convention emphasized real estate speculation as being the driving force behind much of the displacement in the neighborhood, both today and historically. Participants watched a film on the history of the displacement of tenants in the Western Addition that was introduced by lifelong resident and state democratic party delegate Wade Woods. Tenants discussed the differences between private and public housing, the types of tricks landlords use to evict tenants, how to deal with pressure tactics from landlords, and how to organize together. The convention was dedicated to Iris Canada, 100-year-old tenant who was evicted from her home of 50 years on Page Street. Her niece Iris Merriouns spoke passionately about her aunt’s long fight to keep her home. Her words provided inspiration to continue the fight to keep people in their homes and to stand up for their tenant rights. North Beach: June 21st at the Lombard 21: Senior & Disability Action and North Beach Tenants Committee hosted a Speculator Watch Club, where neighborhood tenant leaders defined what speculation looks like in North Beach and how to stop it. 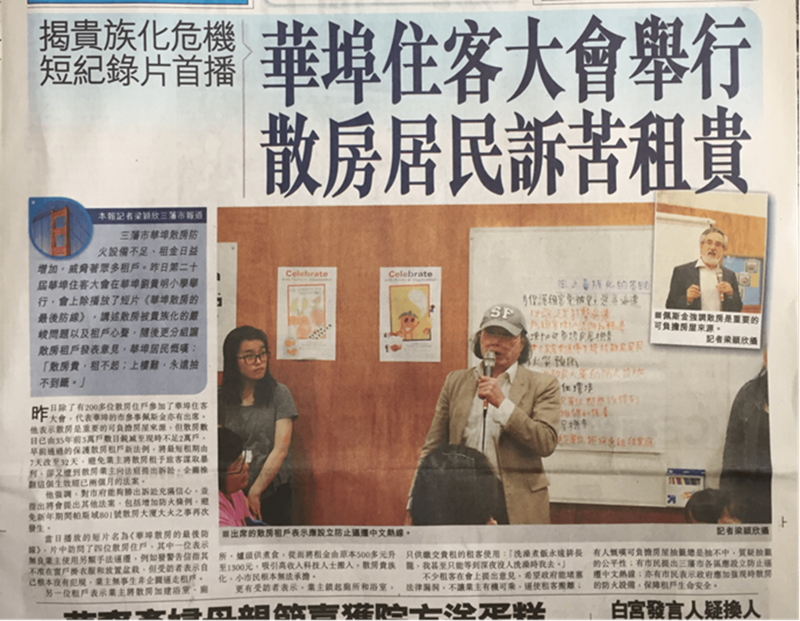 Meeting in the living room of a longtime resident, every attendee committed to sharing “know your rights” flyers in Chinese and English with any building that has a For Sale sign in the neighborhood. Many took on specific roles to monitor Ellis, Owner Move-in, Short-term rental buildings in the area. The group plans to continue to meet going forward. Tenderloin: June 28th, 826 Valencia Tenderloin Center: The Tenderloin Tenant convention gave space for residents to form relationships and tell their stories. The convention also featured interactive civic art projects: mapping displacement on wall-sized maps; podcasting stories of gentrification; and writing the SF Planning Department with insights and potential solutions. The convention also included know-your-rights information to protect tenants against unjust eviction, as well as opportunities to mingle with residents and non-profits allies from numerous housing-rights oriented organizations. SOMA: June 28th, Bayanihan Center: The convention, hosted by a wide range of central city organizations, including SOMCAM and the Veteran’s Equity Center, was open to residents citywide, and included know-your-rights skits by SOMCAN youth, a screening of Holding Out, a short film on Ellis Evictions in the city, free legal advice, and door prizes! Tenants left energized and excited to help support their neighbors and friends in staying housed and fighting speculation.